How To Play Ukulele | Zing! For such a cool little instrument, the ukulele or ‘uke’ hasn’t been around for too long. Originating in 19th century Hawaii, it was an adaption of the Portuguese Machete (an instrument, not the weapon). From the shores of Hawaii, it soon gained popularity and spread across the world with good reason: its fun to play, sounds great and most importantly for the beginner, it’s relatively easy to learn. Want to try learning to play ukulele? Cool. There are different sizes of ukuleles to consider, four main types in fact. 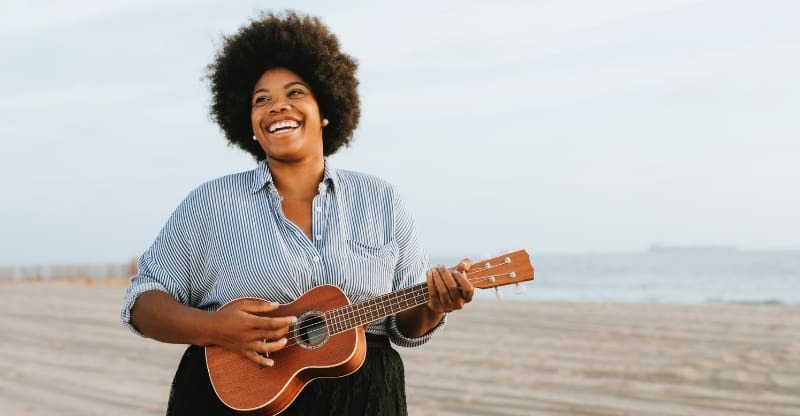 Soprano: The soprano is the smallest is ideal for children wishing to play or those wishing for the traditional, bright sound we associate with ukuleles. Concert: The concert is slightly bigger by a couple of inches and produces a deeper sound. Tenor: The tenor has a length of 26 inches with a bigger fingerboard. This ukulele is ideal for those with larger hands. Baritone: The Baritone is the largest uke (30 inches) and produces a much deeper bass sound. This is considered the easier instrument for those transitioning from a guitar to a ukulele. Uke’s are categorized by shape too. Three popular ones are Guitar/Figure 8 (the most common and well known of the shapes), ‘Pineapple shape’ and ‘Boat paddle’ shape. Ukuleles are also made from a variety of different woods. A popular option is Hawaiin Koa, which gives a balanced tone. Mahogany is the most well known as it gives the classic sound of the ukulele without being too thin. Next up, you need to tune it. With only four strings, the uke is quick and easy to do. The four strings of the uke go, from lowest to highest, G > C > E > A. To tune, buy a tuner (or find one online), pluck each string in turn, and adjust until you have each one in tune. Once your uke is in tune, it’s time to learn some simple ukulele chords. Practice with each separately until your fingers are comfortable, then practice going between the different chords. Try strumming a few times with each one until you can effortlessly go between each one. The easiest songs to learn to play first are nursery rhymes like Baa baa black sheep, but unless you have kids to entertain, that won’t get you very far. For a simple modern song, try playing U2’s ‘Still Haven’t Found What I’m Looking For’, or Simon & Garfunkel’s Cecilia, both of which are super easy to play.